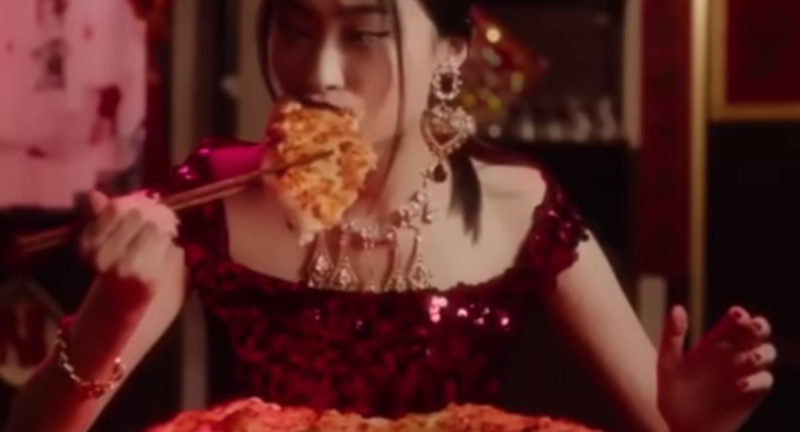 This week we have quite a mix of stories topping the list from Chinese media, including an offensive chopstick video that will probably sink the fortunes of fashion house Dolce & Gabbana in China, a second-place marathon finish that put (excessive?) Chinese nationalism in the spotlight, and an order to one of the country’s most successful broadcasters, Hunan TV, to tone down its entertainment content. Another significant story this week is about a video conference in which the Central Propaganda Department apparently urged government and Party organs, and Party members, to make sure they are reading official Party newspaper and periodicals. That should be read as another signal of the Chinese Communist Party’s determination to maintain and renew dominance over public opinion in the face of a mobile-driven revolution in communications. Worsening matters, the immediate response to the rising controversy by Stefano Gabbana, the fashion designer who co-founded the fashion house with Domenico Dolce, was to unambiguously insult China and Chinese in private messages that were leaked to the media. “China Ignorant Dirty Smelling Mafia,” he added with unmistakable venom. On November 21, a Dolce & Gabbana fashion event called “The Great Show,” planned for that evening, was cancelled. The show had previously been billed as the biggest fashion show in the house’s 33-year history. The China market has recently accounted for roughly one-third of Dolce & Gabbana’s global sales. The next day, major Chinese online retailers such as Xiaohongshu (小红书) and Ymatou (洋码头) dropped Dolce & Gabbana. On November 23, Domenico Dolce and Stefano Gabbana finally sought to address what was now a full-blown crisis with an apology video in which they said “sorry” in Chinese. But by this point it was already too late to stem the damage, and the outright rejection of the D&G brand and even more extreme expressions of Chinese nationalism became a form of political correctness. Those trying to inject nuance into the discussion had to tread very carefully. Hu Xijin, the editor-in-chief of the Global Times newspaper, which is generally among the first to fan nationalist responses to international affairs, wrote on Weibo: “We see one Italian fly into a rage against China in a chat and this quickly becomes something that ignites nationalist sentiment throughout public opinion — with celebrities also openly expressing their feelings about it, some even directly appealing to nationalism. This scene strikes one as somehow not right. On one side is an Italian individual and company, and over here on our side we quickly make it an issue for our entire society. How is it we make this out to be something like the Mukden Incident or the Marco Polo Bridge Incident? Tsinghua University professor Guo Yuhua (郭于华) wrote on November 24 on his WeChat public account that the readiness to denounce so fully and harshly anyone who insults China is a mark of fragile confidence. Guo’s post was quickly removed by censors. During the Lake Taihu Marathon, held in the city of Suzhou on November 18, female long-distance runner He Yinli (何引丽) twice had her form thrown off by race volunteers who rushed onto the course and placed the Chinese national flag in her hands. In the end, He Yinli finished just 5 seconds behind Ethiopian runner Ayantu Abera Demisse, accepting the second-place prize. The actions, broadcast live on Chinese state television, drew criticism from commentators and were the subject of lively commentary online. On November 16, China’s Central Propaganda Department hosted a video conference dealing with the circulation of Party publications. The video conference was reportedly intended to convey the demand to Party and government organs at all levels that they must strengthen their “subscription work” (订阅工作) and “increase expenditure guarantees” (加强经费保障) — meaning essentially that they must spend money on subscriptions to official publications to ensure that “the circulations of Party newspapers and periodicals remain stable” (党报党刊发行数量稳定). The conference also urged the need for Party publications to use electronic reading boards (电子阅报栏) and new media channels to expand their reach among media audiences, including Party members and officials. The conference almost certainly reflects broader concern within the Party leadership that the digital transformation of the media is making it more difficult for traditional Party media to make themselves heard. Reports said Hunan TV planned to address these concerns first by increasing the amount of news programming during prime time, and also by increasing “public welfare programming” (公益类节目) and public service announcements. On November 17, Caixin, one of China’s most respected news outlets, ran a story called “A Chronicle of Fear in a Quanzhou Hotel” (泉州酒店惊魂记), which detailed how the writer, journalist Zhou Chen (周辰), had been intimidated by local police in the city of Quanzhou, in coastal Fujian province, as she attempted to report on a chemical spill at a local oil port earlier this month. In her account, Zhou said she had reached the scene of the spill soon after initial news of the accident emerged on November 4. But on November 11, as she continued to report the story, she alleges that she was tailed by a law enforcement officer. Later that night, she says, she was invited to the lobby of the hotel where she was staying to have a talk with the propaganda chief of Quanzhou’s port district — an invitation she declined. Typically, such invitations in China can offer officials or others an opportunity to offer journalists payment to back off of a story, or to otherwise pressure them to drop their inquiries. Editors at media with a stronger sense of professionalism, such as Caixin, will generally instruct their reporters to avoid such traps. Zhou Chen then wrote and filed her report on the spill, heading off to bed early. She was already in bed when she heard the sound of a keycard opening the hotel room door. Four men wearing police uniforms barged into the room, saying they were from the local police station and asking to see her identification. They claimed they were conducting searches for prostitutes and their clients. 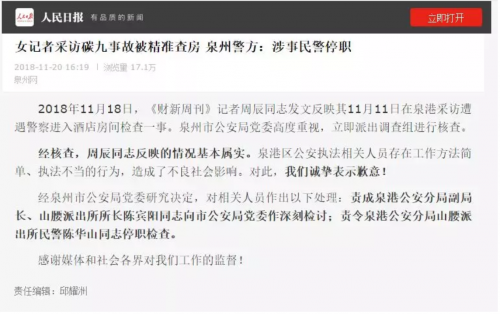 The official WeChat account of the People’s Daily reports the apology from Quanzhou police over the November 11 intimidation of a Caixin journalist. A bald-headed officer, says Zhou, instructed two of his deputies to search the toilet and balcony to see if anyone else was present. During the search, she says, they never produced any identification. After the men left, Zhou received a phone call from the hotel service desk apologising and saying that the police had demanded that they provide a copy of the keycard for Zhou’s room, and confirming that they had not demanded keycards for any rooms other than Zhou’s. On November 20, the Quanzhou Public Security Bureau issued a formal apology and said four officers were under investigation for overstepping their authority and causing “a negative social impact.” Three of these were “auxiliary officers,” the bureau said, meaning that they were charged with assisting police. The bureau also said that a deputy bureau chief was facing disciplinary measures. In a post this week, the WeChat public account “Zero Distance Pollution Squad” (零距离污染特攻队), which tracks pollution issues in China, said that based on its observations, the spill in Quanzhou is larger than the 6.97 tons still officially reported by the local government. NextWhy is Huawei Out in the Cold?